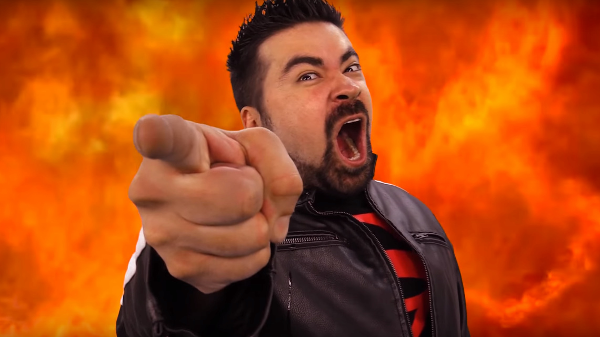 Angry Joe, host of Angry Reviews, Top 10s and Top Reasons Why, left Channel Awesome immediately following Channel Awesome’s latest response to allegations from several former producers and employees. In a statement seen here, Channel Awesome accuses some of the former employees and producers of making false allegations out of vindictiveness. Channel Awesome created timelines and produced texts to refute several of these allegations and explained that all producers knew up front they would not be paid if they chose to take part in creating DVDs. Channel Awesome denied an atmosphere of misogyny and cited several current female producers who say they have never had a bad experience. Channel Awesome’s previous statement and subsequent silence on the matter resulted in a mass exodus of producers leaving the site, an event manu fans refer to as The Channel Awesome Implosion. Many producers felt Channel Awesome executives should have been more open with them about the controversy and many of those leaving expressed anger at the wording of the first statement. Formally at 40 producers, the number shrank to 13. With the departure of Angry Joe, seen by many fans as indispensable, the number shrank to 12.